There will be cold readings from the script. Come with any scheduling conflicts ready. 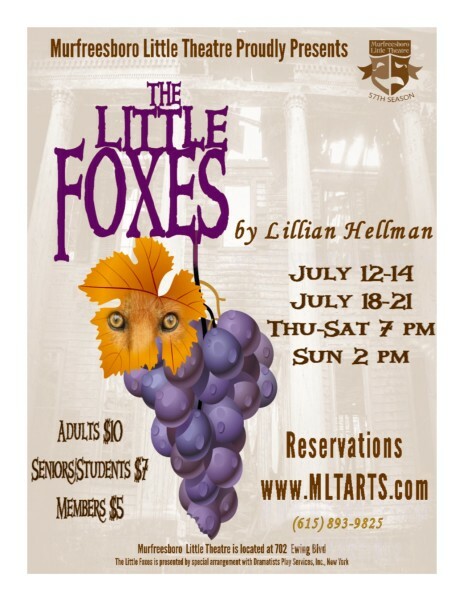 Lillian Hellman’s riveting drama captures the story of a Southern family whose selfish pursuit of the American Dream ends up destroying them and those they love. The Hubbards are bound together by blood, but ripped apart by disparate desires. Their simple house servant states, “There are people who eat the earth and other people who stand around and watch them do it.” The Hubbards are those who “eat the earth.” Three siblings --the manipulative, scheming Regina; the cruel and arrogant Oscar; and the possessive Benjamin-- have decided to partner together to increase their already substantial, ill-gotten wealth. There is only one problem: Regina’s terminally ill husband, Horace, is refusing to give them the $75,000 they need. And so begins a vicious circle of lying, scheming, cruelty, and finally, murder. In the end, blood and money mix, with money coming out on top, leaving a broken family behind. Addie (40’s-50’s): African-American woman, conscience of the play; smart, speaks her mind, sees and knows all. Cal (40’s-50’s): middle-aged African-American man; tries to reason things out; follows Addie’s directions. Birdie Hubbard (35-50): pretty, well-bred but faded southern lady; nervous, timid, sad, excitable, beaten-down. Oscar Hubbard (40’s-50’s): sour, mean-spirited and jealous; always feeling cheated out of life. Leo Hubbard (20’s): “a weak kind of good looks”; not too bright, but sneaky; tries to connive a way out of trouble. Regina Hubbard Giddens (40’s): smart, handsome woman not content with her life; she wants it all. William Marshall (40’s): pleasant, self-possessed business man. Benjamin Hubbard (50’s): jovial but cunning, patient – will wait to get his way; never angry - but don’t cross him. Alexandra Giddens (Teen-20’s): pretty, delicate young lady; sheltered, but starting to question life. Horace Giddens (40’s-50’s): once attractive, but now ill; intelligent, soft-spoken, self-aware.